Winter is coming. 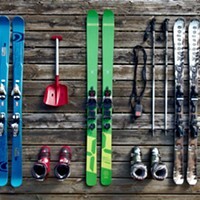 Which means it's almost time to kick the dust off your ski boots and cash in those sick days you've been stashing away. For those who find groomed slopes and lift rides too tame, Three Sisters Backcountry has brought a more ambitious skiing option to Central Oregon. There are no greens, blues, or black diamond runs on The Hut to Hut Nordic Traverse experience. Only unkempt powder awaiting fresh tracks. Using metal-edged cross country skis or snowshoes as transportation, guests on this expedition travel from one hut to another on a 22-mile self-guided trail that snakes through the isolated Three Sisters Wilderness. "You have Meissner and Bachelor where people can skate ski and classic ski in loops, and then there's backcountry skiing on big mountains," says Jonas Tarlen, co-owner of Three Sisters Backcountry. "But there's a whole world of skiing in between where people can have a backcountry adventure and not worry about avalanche training or steep slopes." The first day of the experience begins with an early morning briefing to go over the route and snow conditions with the staff, all of whom are certified in wilderness survival and avalanche response. Guests are given a waterproof container enclosed with maps and route descriptions just in case the wand and diamond markers along the trail aren't clear enough. A half-hour shuttle ride takes groups to Dutchman Flat, where they depart and ski eight miles through old-growth hemlock forests north to the Happy Valley Hut. Constructed earlier this year, the steel-sided, wood interior hut is insulated and fits eight bunks, a stocked kitchen (with a fridge full of Good Life beer), living room, and wood stove. The amenities make it easy to pack light. After an evening of defrosting and re-energizing in the hut, skiers take off the next day for another eight mile push to the Lone Wolf Hut, dwarfed by in-your-face views of Tam McArthur Rim and the Three Sisters. With sideline seats to the Cascades' beauty at the second hut, guests want to arrive with enough daylight to explore the meadow at their final pit stop. If 16 miles in two days sounds daunting, don't worry. The final leg of the trip is like the last 100 meters in a marathon. The shorter six-mile segment drops more than a thousand feet from the hut to the parking lot. There are no age restrictions to reserve a spot on the Nordic Traverse trail. According to Tarlen, fitness and basic knowledge of off-trail nordic skiing are the only requirements. Last year was the first season TSBC offered this experience and the skiers and snowshoers ranged in age from 20 to their early 70s, Tarlen says. Although TSBC does offer guided trips, groups on the Nordic Traverse are expected to be self-sufficient and prepared in case of an emergency. But the risk is relatively low. Unlike TSBC's ascent/descent hut-to-hut experience at Tam McArthur Rim, the Nordic Traverse trail traipses across rolling, gentle hills with no avalanche danger. Snow conditions are variable and there's no guarantee of a powder day. The trail can at times be packed and icy from previous guests, but it's still the best option for secluded skiing in the area. "We didn't have a lot of snow last year, but it was actually a fantastic year to do the Nordic Traverse because you don't need much snow to do it," Tarlen says. Rates are $225 per person, which includes the shuttle, lodging (sleeping bags are provided in both huts), food, and beer. Guests can book their excursion a week in advance, but it's recommended to make reservations in the fall, especially when planning a holiday visit. Those who take the nordic journey over the weekend get the hut exclusively to for group. For midweek visits (leaving Sun.-Wed.), the atmosphere resembles that of a hostel nestled away in the woods, as groups often end up bunking in the same hut as other guests. Aside from the Nordic Traverse, TSBC also offers a high altitude hut-to-hut experience on Tam McArthur Rim, guide service, and hut-based avalanche education courses. Snowmobiles are not permitted on the trail and there's no humming snowcat motor to be heard; the only noise along the way comes from snow-toppled cracking branches, bird chirps, and your companions' voices. It's classic, old-fashioned skiing. "At the Nordic Center, Mt. Bachelor, or most other places around here, you ski in a circle and come back to your car," explains Tarlen. "When you can go from point to point while you're traveling it changes the whole experience. It makes it an adventure." For more information or to book your winter adventure go to threesistersbackcountry.com.